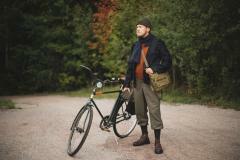 Wool terry construction works amazingly well with socks, and even better with Merino wool. 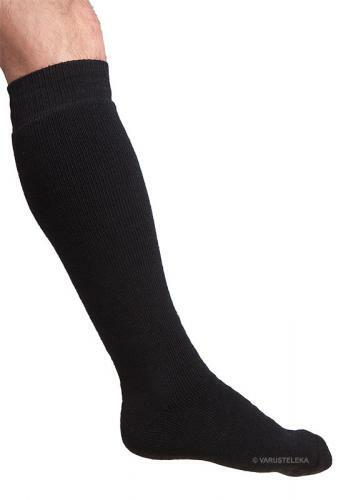 These knee-high socks are at their best during autumn, winter and spring, but thanks to the whole aforementioned terry thing, tend not to cause excessive sweating during summer months either. Made in Finland! The speciality of these socks is the terrycloth fabric. 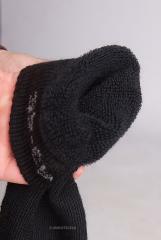 The inside of the sock is full of small loops, just like on your standard towel, which makes the surface area quite massive and the fabric nice and thick. Thanks to the construction these are quite airy and allow for some airflow, making them quite comfy no matter what the temperature outside is. These work well on their own or coupled with others. 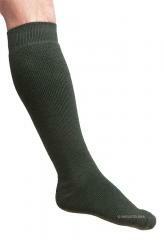 An additional benefit of terry knit is the fact that these won't slide and wrinkle when worn. Merino wool is moisture wicking, quick drying and self-rinsing. It's also machine-washable, but washing is usually unnecessary - wool cleans itself. Machine wash in 40 degrees Celsius when needed. When not in use a good shake and airing outside will magically cleanse the wool. You only need to wash merino wool if you see stains or the clothing starts to smell really bad. This usually requires lots of continuous use without airing. Made of 60 % Merino wool, 38 % polyamide, 2 % elastane. The polyamide is added to the mix for wear resistance, you can march countless miles before wearing these out. The sock will shrink about 10 % in the first wash. This is taken into account in the sizing. And yes, the wool is mulesing free! 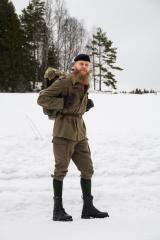 Särmä is our own brand of clothing and equipment. When you buy Särmä you get purpose-built stuff at a decent price, something that will fill it's intended role well and not cost you an arm and a leg! I've been using the very similar Woolpower product for a long time, summer and winter. Naturally got a few of these as well. These are essentially the same, but made in Finland instead of Sweden and cost less. Thanks to the wool material and terry knit, your feet will stay surprisingly dry. For reference, if you are used to wearing cotton socks, these are STILL better than those during summer. If there's anything to nitpick about, I'd wish for a bit shorter version. Being what they are and solidly made, the service life is long. Even when the heels start to eventually thin out, you can just darn them (do learn this skill, it's pretty easy!) and keep going - these are definitely worth some love and care! Hinnakkaathan nämä ovat, mutta ovat myös hyvät. Ajosaappaaseen loppusyksystä ja talvella aikalailla ykkösvalinta, kun yltävät koko varren matkalle. Vaikka jalka hikoaa tai sukat kostuu muuten vaan luonnonvoimista, niin silti tuntuvat mukavilta, eivätkä "imeydy" saappaan sisukseen kiinni, kuten puuvillaiset vastineensa. Ja vaikka ovatkin tennissukkaa paksummat, niin eivät aivan tumppupaksua materiaalia, eli sopii myös omassa käytössäni tarvittaessa lenkkariinkin. I was searching for the perfect socks for the long and lonely winter nigth. And these ones... oh boy... the perfect size. Thick, long and very warm. Great to wear for winter especially during the midwest Polar Vortex all the way to Moscow, wore them in both!